Dental Implants Restore Missing Teeth with Natural-Looking Results Stop hiding your smile, rejuvenate with our custom tooth restoration procedures. Whether you have one or several missing teeth, dental implants can rebuild your smile and restore your self-confidence. Dr. TJ Imm uses special techniques to ensure optimal placement of our dental implants and also offers implant supported dentures as an alternative to dentures. Get the smile you’ve always wanted with a custom, permanent tooth replacement solution. Schedule Now. Our doctor uses techniques from The Dawson Academy to place and restore dental implants with a high success rate. He has completed continuing education credits to learn the latest techniques in implant dentistry so you can look forward to lasting results with your procedure. We will fuse the implant into the jawbone and create a custom restoration that sits on top. This recreates the tooth structure and since it is attached to the jaw bone, also stimulates the bone just like your natural teeth. We may recommend permanent dentures as an alternative to traditional dentures for some patients. This procedure involves placing a set of dental implants in the jaw and fitting a set of custom dentures on top of the implants. 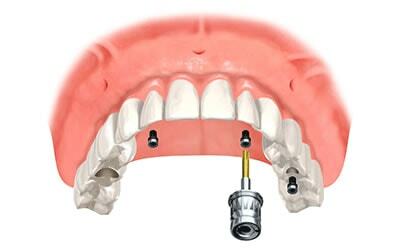 This prevents the dentures from shifting or moving when the patient eats and talks. We attach the dentures using a ball-retained or bar-retained mechanism which means there is no need to use paste and adhesives to secure the dentures. Learn more about replacing missing teeth with dental implants by scheduling your appointment at 5 Points Advanced Dentistry today.